Pepo is enjoying his retirement in Kent, having fathered ten off spring it is unlikely he will be required to breed again so he can just relax, enjoy the sun whilst watching the trains pass our site. He weighs in at a good 47 Kg (approx 94 lbs) and eats on average between 4 - 5 Kg (8 – 10 lbs) of meat three times a week, with the occasional extra chicken or rabbit. 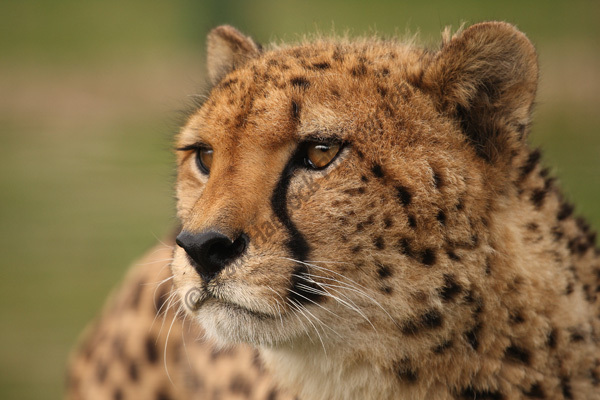 Pepo is tall and sleek and is a good specimen of a cheetah. He is happiest lazing around in his enclosure waiting for the next meal to appear over the fence. With his chirping and the occasional chasing of a "diesel train", Pepo is a placid, friendly cat who knows how to pose for the cameras.